Whether its spices in mulled wine or in the Christmas cake, spices have long been part and parcel of Christmas. Steenbergs Christmas Survival Box takes nine key organic spices to get your Christmas off to a flying start. 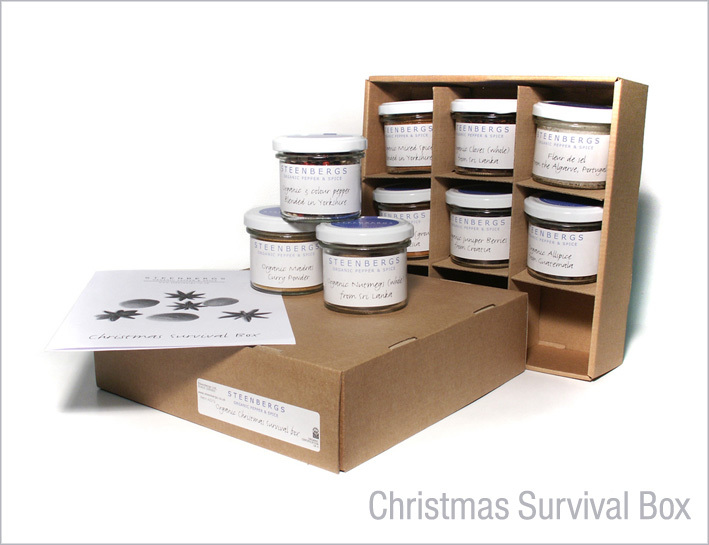 The Christmas Survival Box includes a selection of the following organic spices: Steenbergs organic mixed spice, organic whole cloves, organic three colour pepper, Steenbergs organic Madras curry powder, organic allspice, organic cinnamon, organic nutmeg, organic juniper berries and Portuguese Fleur de sel. Also included is a recipe leaflet to help get you started, including brief outlines of each of the spices in the box. -Spices Starter Box(£21.00): A fantastic collection of 16 organic spices and herbs. Great starter box for any kitchen. - Vegetarian Kitchen Box(£22.50): especially designed to bring together some of the most interesting spices that help add flavour to vegetable dishes. - Indian Spice Box(£22.50): experience the full flavours of Indian cooking from fiery cayenne pepper to cooling cardamon. - Fairtrade Spice Box(£22.50): celebrate Fairtrade with this box of organic and fairtrade spices and flavoured sugars. - French Spice Box(£22.50): with all the essential spices amd herbs to produce fantastically flavoured cuisine. The French are known for never cooking without them!. - Thai Spice Box(£22.50): packed with fantastic smells and wonderful tastes for the perfect Thai experience. - Baker's Spice Box(£22.50): cake, scones, biscuits - if you just love baking (or you know someone who does), this is the box for you. - Mini Spice Box(£11.00): Mini Spicy Box or Mini Herby Box just 2 great mini collections to compliment any kitchen. - Wedding Spice Box(£22.50): A great and original wedding gift. Spices have been a traditional gift at weddings for many years, while herbs have been linked to romance – nutmeg is a traditional good luck charm in continental Europe. This press release was distributed by ResponseSource Press Release Wire on behalf of By Nature in the following categories: Home & Garden, Women's Interest & Beauty, for more information visit https://pressreleasewire.responsesource.com/about.